What do you do with yourself when you have all the time in he world? Ghandi had some good advice – Live as if you were to die tomorrow ~ Learn as if you were to live forever. Learn! Discover! Re-educate yourself! An old U.S. advertising campaign for education use to sign off with these words ~ a mind is a terrible thing to waste; to which I would add ~ especially when you retire. Of all the idiosyncrasies that come with old age, the closing of your mind, in my mind, is potentially the most debilitating. Retirement should not mean the retirement of your thirst for knowledge, your curiosity, or your quest for an understanding of what the world is all about. The meaningful learning opportunities that exist for the inquiring mind suddenly open up to the one who has the time and the desire to pursue them. You would be surprised how easy it is to put yourself in a learning situation. In my part of the world I was happy to discover a small cottage industry of seminars and lectures conveniently available for a small fee. Most are offered by not-for-profit, volunteer managed organizations. If you live in Grey/Bruce County check out The Bluewater Association for Lifelong Learning www.bluewaterlearns.com. In Collingwood there is the Georgian Triangle Lifelong Learning Institute http://gtlli.ca. Saugeen Shores offers The Chantry Institute Lecture Series www.brucemueum.com .They also feature recorded seminars with world renown scientists in The Perimeter Institute Public Lecture Series http://pirsa.org. And there is so much more if you look for it. All of these lectures are delivered by active and retired teachers, university professors, artist, writers, scientists, and highly placed working professionals who unselfishly share their time and knowledge with those who want to learn. Winston Churchill sarcastically said ~ I am always ready to learn, although I do not always like to be taught. Well, the pressure to learn now becomes the pleasure of learning. There are no questions other than the ones you want to ask. There are no exams. You control the curriculum. Topics you never had time for, those subjects that were once a mystery, everything you ever wondered about, is spread out before you. The hardest thing you have to do is pick and choose. Enlightenment, inspiration and information are out there for the mind open and curious enough to seek. I never considered myself part of a demographic. Never, that is, until I was notified of my eligibility to receive compensation for being of a certain age. Canada Pension wanted to give me back a meager portion of the countless dollars I had contributed all my working life. What I realized, right then and there, was that I was now considered different. My new classifications were Retired, Senior Citizen, Pensioner, a full-fledged member in good standing in the Golden Age Club and one step above Baby Boomers. As someone in their sunset years I am a statistic in that target group marketers and advertisers pursue with diligence and diffidence. I don’t like being pigeonholed much less being considered old. All of that ageism comes with the stigma of someone who can finally spend the rest of their life on the golf course, taking bus tours, gardening, looking after their grandchildren, reading or getting lost in that insidious little screen. I have learned, though, that there are those of us who, as Dylan Thomas said, rage against the dying of the light. We are the retired ones who don’t considered ourselves retired. We still get involved by spending our days actively pursuing whatever it is that keeps our brains from going soft. I met a group of these very people the other day at the Legion in Owen Sound. I was there to attend a lecture sponsored by the Kiwanis Golden K Club. The primary purpose of their organization is geared to helping others. They spend their days in volunteer work. They were sharp in their observations and decisive in what they wanted to do. They were smiling and friendly to an outsider like myself. These folks, much older than I, stay committed in spite of their personal health problems. Some say that in old age we become like children again. If so, there was a childish delight in how they went about their business. There was innocence in their attitude belied by a sense of purpose honed by years of experience. In short, they were sharp. Not old. And doesn’t that term have a resonance to it. Elders. Our First Nations respect and seek the advice and council of their Elders. It’s the same with other indigenous peoples. They’ve done so for decades because with age comes experience, wisdom and knowledge that the young have yet to encounter. Perhaps we need to do away with all the labels sewn into the fabric of those who have reached that time in their lives. Give us our due. Call us Elders. And we will pass on all that we know of this world. Sometimes my answer to the first question is: Nothing! And to the second I always say: No! I am living his wish right now. But if he were alive he’d be up here. And, I’d be labourer to his stonemason as we built one of his famous outdoor fireplaces that doubles as a Bar-B-Que and pizza oven. It would be a satisfying way of doing nothing. But that’s another story. I am at the far end of the continuum now. Things happen at my pace. My decisions are influenced only by those closest to me. Although I’d like a radio station that plays jazz all day…and a place that bakes bagels like Gryfe’s does, and a bakery that knows how to make a true croissant. But these are just little things. In the grand tapestry of life they are but loose threads. He was 85 when he came to this conclusion. I reached it a long time before that. Old friends are well worth spending time with. And so it was that on a foggy Saturday morning I set out to join my buddies for a Drum Corps weekend in Rochester. I’ve known these guys since grade three. 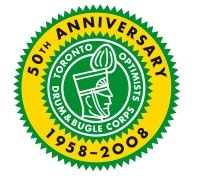 Went through Cubs, Scouts and the Optimist Drum & Bugle Corps together. Stayed in touch over the years through our lasting friendship and mutual obsession with the Drum Corps world. We thrived on the camaraderie and the competition. It taught us lessons that got up through life – to where we are today. We grew up together and we never grew apart. I misspent my youth on countless buses, on many long road trips all over Canada and the U.S. with these guys. Now, as old geezers, we were going to do it one more time. N. and I left Southampton early. The roads were empty…the farm fields harvested and golden…the leaves turning and the fog in the valleys sitting thick and heavy, denying the sun access to the earth. As soon as we left Bruce County the sun broke through and it wasn’t long before we were ensnarled in Toronto traffic. Nonetheless the day was spectacular. It was going to be a great weekend with the boys. The traffic though, never let up. From Toronto to the Niagara Falls border we crawled – stop and go – bumper to bumper. I had already been three hours in a car. This added another three. My knees were starting to question the wisdom of this trip. Once we hit New York State we made the outskirts of Rochester in good time. Years ago we would head straight for the practice field, even before checking in. This time we bypassed our hotel and headed straight for the outlet mall. When, I wondered, did we turn into bargain hunters? By the time we checked in I had been on the road for 11 hours. There was no joy in that. But, there was joy in my first American beer with the boys in years. That night, we headed into the historic center of Rochester for a Corps dinner at the TripHammer Inn. Old friends! Old memories! So much grey hair! Everyone had put on weight. Our young, lithe, hard bodies were gone. We were old farts. But, we were together and the good times flooded back. After dinner, we took in a late rehearsal with the Optimist Alumni Corps and quietly congratulated ourselves on having the good sense not to be playing members any more. Over the next two days we got lost on the Interstate – a lot. Ate some great Bar-B-Que at Dinosaurs Rib House with the Harleys lined up outside. We looked but didn’t touch because full patch Hell’s Angels were drinking at the bar. A hard-boiled egg blew up in my face (don’t ask), and I got stung in the stands (again, don’t ask). It was a great weekend. We marveled at the skill and musicianship of the competing Corps…so much better than we were in our day. We talked about our past history together, our lives, our accomplishments and unspoken failures, our aches, pains, medications, life, politics, religion and other trivialities…but mostly about Drum Corps. After all, that’s why we were there. The immersion in our past left us refreshed. We were young again. Driving back to Toronto was fast and uneventful. N. had her weekend with the girls. I had mine with the boys. We met up and headed out. The road to Southampton was clear and quick. Leaving home always makes the return trip that much better. Still, it was good to get away. It gives me a greater appreciation of what I’m coming back to.